Norwalk, CT – Ask any knowledgeable Blue Oval enthusiast to name the quickest pure-production Mustang of the muscle car era, and most will say the 1968 Ford Mustang 428 Cobra Jet. It was based on the staid 428-cid big-car engine, but had larger valve heads and the race-brewed 427’s intake manifold. It also had ram-air induction and a functional hood scoop. The scoop mated to a special air cleaner with a vacuum-actuated butterfly valve that funneled air directly into the 735-cfm Holley four-barrel carburetor. Output was around 410 horsepower, but Ford rated it at 335 horsepower in an effort to calm insurance agents and con dragstrip rules-makers. With 11.5-second ETs at 120 mph, the factory team of eight specially prepared 1968 Ford Mustang 428 CJs obliterated everything in their Super Stock class at the ’68 NHRA Winternationals. The impact was no less forceful on the street. “The entire world will come to recognize this engine — the 428 Cobra Jet — at the pop of a hood,” declared Motor Trend. Finally, thanks to the 1968 Ford Mustang 428 Cobra Jet, the competition was chasing Mustang’s tail. The 428 Cobra Jet was born of Bob Tasca’s desire to win. Bob Tasca needs little introduction with longtime Ford buffs. But if you’re just tuning in, Bob Tasca’s Ford dealership in Providence, RI (now Tasca Automotive Group),was quite active in drag racing back in the ’60s. In his desire to win, it’s safe to say that Bob pioneered the 428 Cobra Jet V-8 using off-the-shelf parts from the Ford parts bin. Ford Motor Company took Bob’s idea and further developed it with a stronger block, similar head castings, and a more aggressive hydraulic lifter camshaft to conceive the 428 Cobra Jet. What hurt the Cobra Jet’s development was an ugly United Auto Workers strike that shut down Ford during the fall of ’67. Development of the Cobra Jet didn’t really get underway until December of that year, with the production of a couple of Mustang test mules, then the limited-production run of 50 Wimbledon White fastbacks produced strictly for NHRA competition. Some of those fastbacks were shipped to professional drag racers, such as “Dyno” Don Nicholson, Hubert Platt, and Gas Ronda, as an opening salvo for the ’68 season. These gentlemen went to the NHRA Winternationals in Pomona with their fastbacks and earned Ford some respect. #37 of the 50 factory Cobra Jet 428 drag racers was shipped to Rye Ford in Rye, NY as a promotional vehicle to create showroom traffic. 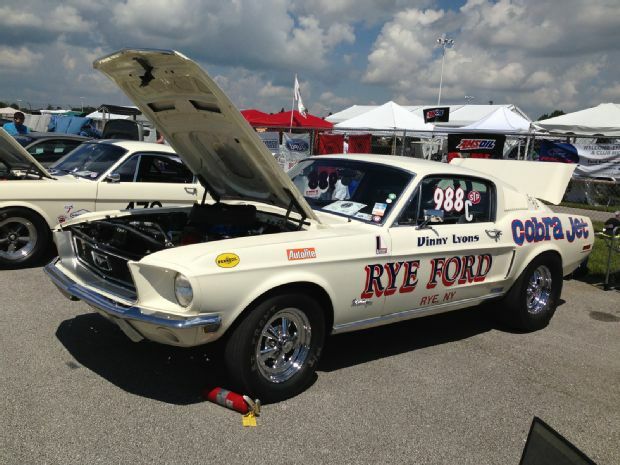 This car was purchased by Vinny Lyons of Port Chester, NY who has owned and raced the car from new right up to the present day in vintage events. Vinny’s Mustang has been a popular featured show car at the Darien Collectors Car Show, now celebrating its 10th anniversary on Father’s Day, June 21st and moving to Norwalk’s Mathews Park, at 295 West Avenue (near the intersection of I-95 and Route 7). The event will be held from 10AM-3PM and will offer hundreds of unique cars to view. Admission to the event is free to spectators; a donation will be encouraged and proceeds will go towards the New England Auto Museum’s building and education funds. The New England Auto Museum is a nonprofit 501(c)(3) organization.